There is a fabulous variety of fish present all over in the world. Each variety is adapted to its own specific habitat. The shape of the fish helps the aquarist to determine the fish habitat. For example, surface dwelling fish have a reversed mouth and a compressed back. Tall bodied fishes are adapted to slow moving waters. 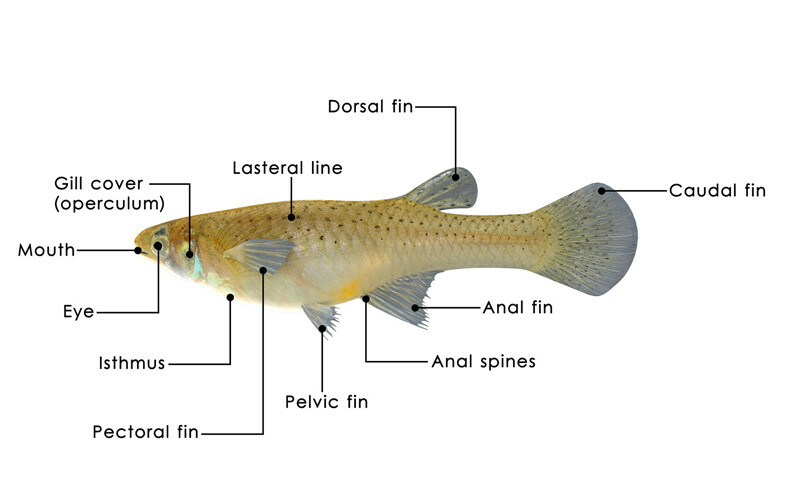 So it becomes a necessity to know about the external anatomy of a fish first. Fins act as the organ of locomotion. Fins are made up of rigid rays. Some fins are jointed and some are separated at the edge. Fishes that have rays which are bony, stiff, and separated are called spines. 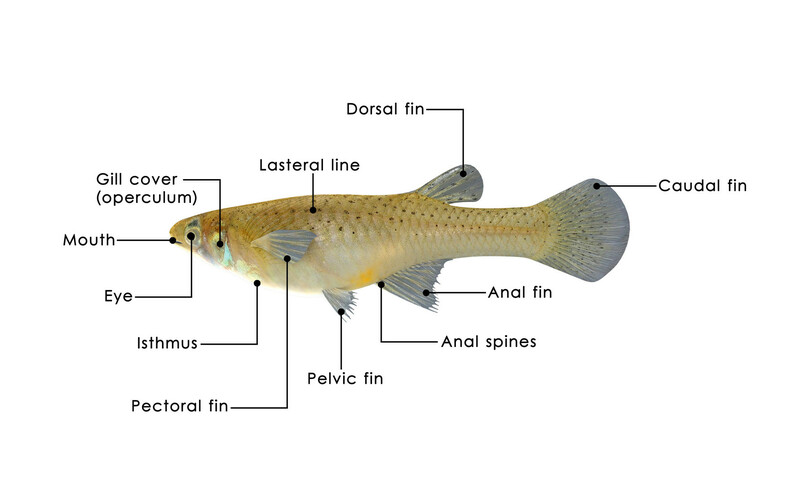 In such cases the front portion of the fish is called Spiny Dorsal and the rear portion is called Soft Dorsal. In Gobi species the Spiny and Soft dorsal are separated and form two distinct dorsal fins. Six types of fins are available and each one it's unique. Each fin on a fish is planned to carry out a particular function. Caudal fin - This fin is the main one for propelling. Pectoral fins- Used for propelling and side to side movement. Adipose fin - Gives Stability while swimming. Fish skin is divided into two layers, outer layer (Epidermis) and the Dermis. The outer layer Epidermis is made up of Epithelial cells. These cells are arranged one above the other and drop frequently and it's replaced with new ones. Slime cells are present in the interspace between the outer cells. The slime coat, a form of mucus is produced by the slime cell that is very important protective covering. Under the Epidermis layer lies under the Dermis layer. This layer is made up of connective Fibroblasts, collagen, and blood vessels. In the pocket of the Dermis lies the scales and it comes out of the connective tissue. The scales are covered by the epithelial layer. The scales overlap with each other to form a protective elastic wall which is capable of withstanding blows and bumping. Scales are of two types, one is serrated, and the other is smooth. In Mailed Catfish bony plates are present instead of scales. Some species do not have scales at all. Gills present under the gill cover help the fish to respire. They are the delicate system of blood vessels covered by a very thin Epithelium through which the fish breathes. The Pharynx wall is perforated with five slit like openings. The tissue between the slits is called Gill arch. On each side of the fish is present five gill slits and four gill arches. The gills are actually mounted on the gill arches. Lateral line is lines that run in a semi line from the gills to the tail fin. It is easily seen as a band of dark line with scales running down the sides. It acts as important sensory organs. 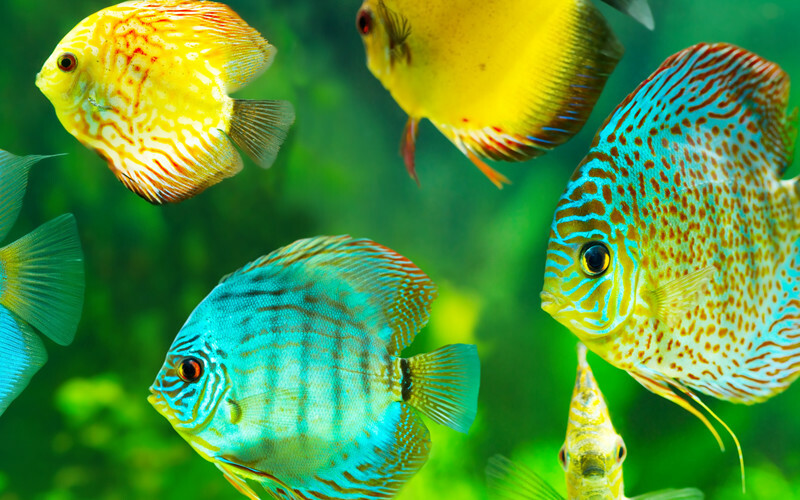 With the help of lateral line fishes can determine electrical currents in the aquarium and to identify its surroundings.